In this case, if you thought there is no way to forward, you are totally wrong. In fact, there are ways, even several, to download Facebook videos to your computer. Here we are going to introduce two of them to help you to download Facebook videos on your Mac OS easily. One of the easy ways to download Facebook videos is using some desktop programs, like the one called Any Video Converter Ultimate for Mac. It is a powerful Facebook video downloader which is able to download videos from Facebook.com and even convert the downloaded Facebook videos to any other popular formats or devices. 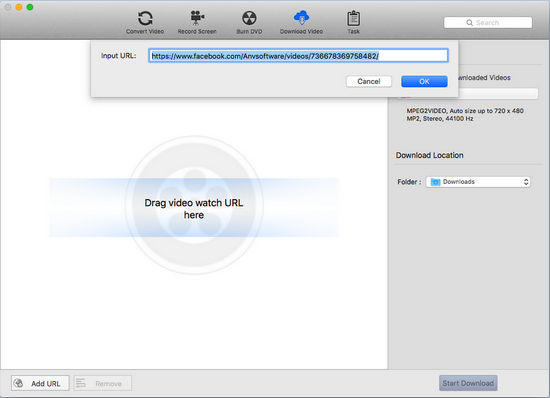 Let's follow the steps below to see how to convert Facebook videos with this Facebook video downloader for Mac. Step1. Open Facebook.com in your browser to find the URL of the video that you want to download. Step 2. 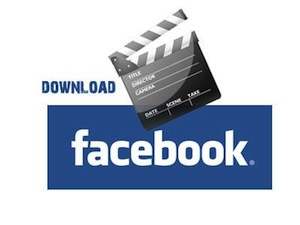 Launch Facebook Video Downloader and add the Facebook video URL to the program. Click "Download Videos" tab > "Add URL" button, you will see a pop-up window to ask you to enter the Facebook video URL. Paste the URL to the box and hit "Ok" button. Or you can drag the video to the program directly. Step 3. Start to download Facebook video. Once the Facebook video URL is parsed successfully, simply click "Start" button on the bottom right to download the Facebook video. Step 4. Find the downloaded Facebook video to play or manage. After the Facebook video is downloaded completely, you can find it by clicking the "Download" on left side bar. Tips: You might like to watch the downloaded Facebook video on some portable devices, like iPod, iPad and so on. In that case, you are likely to convert the downloaded Facebook video into those devices with Any Video Converter Ultimate for Mac. So you just need to find the downloaded Facebook video and click "Add to Convert List" to convert it to any formats you like. You can refer to: User guide of video conversion. Another simple way to download Facebook videos is to use some online video downloader website, though it fails sometimes because of the slow network speed. Here you can try the one called keepvid.com, which is a site that helps you to download the Facebook videos automatically and free. Step 1. Open the website https://keepvid.com/ with your browser. Step 3. Click "Download" button to begin downloading the Facebook video. That's it! Isn't it simple enough? Which way do you prefer the most? Or do you know some other ways to download Facebook videos? Syncios iPhone/iPad/iPod Manager for Mac is a free iTunes alternative, which can easily manage iPhone, iPad and iPod without iTunes and transfer music, videos, photos, apps, ebooks, contacts, messages and more between iOS devices and Mac. 2. How to Share iTunes Videos on Facebook? Facebook is an awesome online social networking service. You can post message,get latest info, and share videos or pictures. But if the video happens to be from iTunes, it'll not be uploadable on Facebook due to DRM protection. To make it possible, you'll need NoteBurner M4V Converter Plus which can convert all M4V video files including your iTunes purchases or rentals to unprotected MP4 format with perfect output quality. After conversion, you can share the unprotected MP4 videos with your friends on Facebook freely. Download the trial version of NoteBurner M4V Converter Plus to have a try! Both Windows version and Mac version are available to download.